With breathtaking scenery in small, historic towns and large, stylish cities, Ontario is a major tourist destination. There is no better way to see the best of Ontario than on a fly/drive holiday. Ontario is the most populated and second largest of all ten provinces in Canada. From the busy city of Toronto to the relaxation of the wineries, there are activities for everyone all year round. During the Summer months, this province has perfect conditions for hiking, camping, boating and fishing! Activities such as skating, hockey and skiing are popular during the Winter months. Touring is easy by car, boat and rail and if you a considering an Ontario fly/drive, we have recommended a few places to pass through! Toronto is a great city to start your Ontario fly/drive journey. It is the largest city in Canada and one of the most cultural and lively cities! There is a big emphasis on arts and culture in Toronto with theatre and dining districts. With art galleries, restaurants and the largest variety of theatres in Canada this makes Toronto a very interesting city. A must see attraction is the CN Tower, the world's tallest freestanding structure. The edgewalk, when you lean over the edge of CN Tower, is for the thrill seekers. Toronto is very easy to get around, whether by foot, car or public transport. This makes it a suitable destination for everybody! 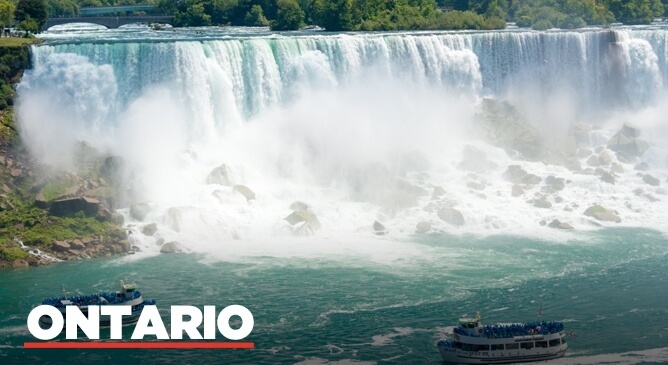 Niagara Falls, one of the seven natural wonders of the world, is just an hour and a half away from Toronto. It is the perfect stop before hitting the open road after Toronto. Three waterfalls, between the border of Canada and the United States make Niagara Falls. There are multiple ways to experience Niagara Falls close up, with Maid of the Mist and Journey Behind the Falls. For those staying in the area there are casinos, spas, golf courses, nightlife and fine dining. For the little ones, there is also a ferris wheel and a water park inside a hotel to keep them entertained. Lush parks and beautiful gardens make Niagara on the Lake a must see town during a fly/drive holiday.This town was placed second as ‘Prettiest Town in the World!’ Over 200 years after its founding, this town aims to preserve the alluring flavour of the past. Stroll through this historic town and see some of Canada's finest Victorian architecture and historic sites. The Shaw Festival Theatre is a popular attraction, showing plays inspired by Bernard Shaws views and his era. Ontario is also home to many award winning wineries. These are amazing and a must to be included on your journey. Wineries in Ontario get almost 500,000 visitors a year. Most wineries are open all year round and offer wine tasting in the wine boutiques. Some wineries have guided tours to see how wine is made and learn the history of wineries. There is a winery for everyone with the choice of eco friendly and child friendly wineries. While in the area, we also recommend trying the famous Ontario ice wine! The Muskokas, known as the land of the lakes, is a natural wonder. It is a district of lakes, waterfalls, granite cliffs, pine forests and maple forests. There are festivals year round and many attractions such as markets, galleries, theatres, museums, historic sites and factory tours! This is a wonderful location to add to your Ontario fly/drive holiday! Ontario is a great choice for solo travellers, couples and families. We would love to help to book your personal tailor made Ontario fly/drive holiday so give us a call on 01-8173535 to speak to one of our travel experts today.